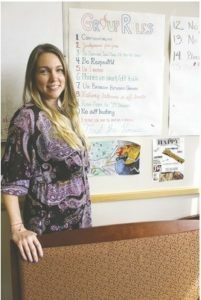 When certified eating disorder specialist Rebekah Bardwell Doweyko returned to Connecticut in 2011, she was surprised to learn only one facility offered treatment for eating disorders, which have a higher mortality rate than any other psychiatric illness and affect at least 3 percent of the state’s population. “I felt like that was a crisis, that the state I was born and raised in is unable to treat the community in an effective way,” Bardwell Doweyko said of treatment for illnesses that include anorexia nervosa, bulimia nervosa, avoidant/restrictive food intake disorder and binge eating disorder. Bardwell Doweyko, an assistant vice president of clinical operations for the Connecticut region of Waltham, Mass.-based Walden Behavioral Care, an eating disorder treatment provider she joined in 2013, said she’s made it her mission to add services in Connecticut so people don’t have to leave home for treatment. She returned to Connecticut from Florida, where eating disorder treatment facilities were common and where she trained at the Renfrew Center, a pioneer in treatment for women. She moved to Connecticut to be closer to family and landed at Connecticut Behavioral Health Partnership in Rocky Hill, where she established an eating disorder niche before Walden recruited her in 2013 to grow what was then Walden’s one Connecticut clinic, in South Windsor. The clinic had five patients a day when she joined and now sees about 40 daily, she said. She also helped Walden add clinics in Guilford, Amherst, Mass., and an inpatient unit at Rockville General Hospital in Vernon. She oversees operations at all four, which see about 108 patients daily, and 53 staff. When Walden opened in Connecticut in 2012, there was only one eating disorder program in the state, Bardwell Doweyko said. Walden plans more expansion. Its goal is to have 90 percent of the population within 45 minutes of a clinic. Its model is end-to-end treatment — from outpatient to intensive outpatient (IOP) care to inpatient hospital treatment and residential treatment, which offers 24/7 support. Walden’s closest residential facility is in Waltham. To provide comprehensive treatment in Connecticut, it plans a residential facility and is focusing on the shoreline. Bardwell Doweyko noted the severity of eating disorders, as reflected in mortality rates due to underlying medical conditions that can accompany the illnesses. Patients can have extremely low body weight, electrolyte imbalances, and very low heart rates and body temperatures, she said. Bardwell Doweyko, 41 — born and raised in Durham, mother of a 6-year-old daughter, and competitive softball and kickball player outside work — planned a marine biology career, which took her to Florida Atlantic University, but a class and textbook about abnormal psychology resonated. She got her bachelor’s in psychology and then master’s in mental health counseling. A job in grad school at the Renfrew Center solidified her career choice. She worked there for 10 years, first as a psychiatric technician, then counselor, then primary therapist and appeared in the Emmy-nominated HBO documentary, “Thin,” filmed there. She then started her own practice in Fort Lauderdale, working part time there and Hollywood Pavilion Hospital, where she developed an eating disorder program before moving north. She’s made it her passion to expand services for people with eating disorders, most of them women and girls, but about a third men and boys. Children, for example, can develop avoidant/restrictive food intake disorder, “basically severe picky eating,” sometimes stemming from a time they choked or gagged on something, or later vomited, so they fear a negative consequence. Youth also can develop anorexia or bulimia. With bulimia, a binge has to occur — about 3,000 calories in about 78 minutes, an amount that exceeds what might be considered too much in a normal setting, Bardwell Doweyko said. There also has to be a compensatory behavior, which can be vomiting, or abusing laxatives or diuretics. Binge-eating disorder, meanwhile, has no compensatory behavior. Eating disorders can emerge from biological, psychological and social factors and “it’s typically a perfect storm of all three coming together at the right time,” she said. Therapy addresses factors influencing the primary eating disorder. Even with those challenges, success stories are ample, Bardwell Doweyko said. “I have seen many patients achieve a full recovery,” she said.